So much I never knew about Groundhog Day! How often is Phil’s prediction correct? 100% of the time, of course! How many “Phils” have there been over the years? 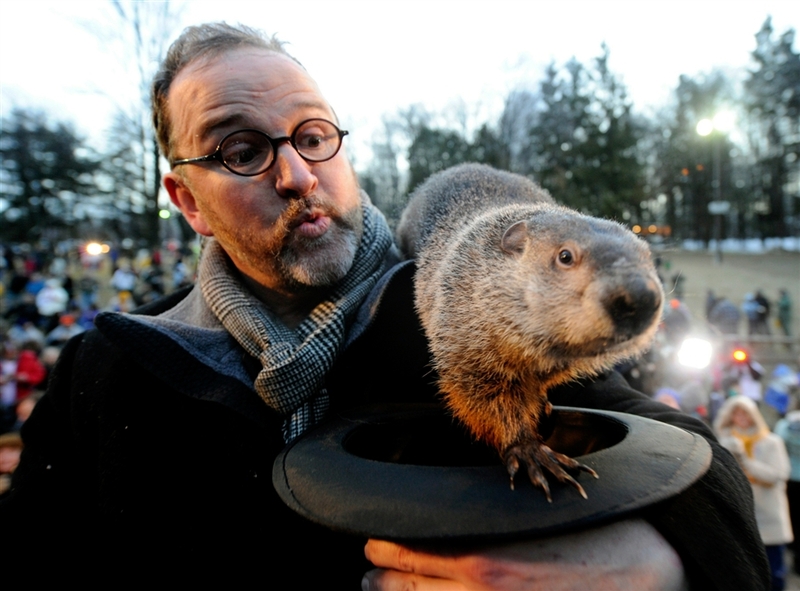 There has only been one Punxsutawney Phil. He has been making predictions for over 125 years! Punxsutawney Phil gets his longevity from drinking the “elixir of life,” a secret recipe. Phil takes one sip every summer at the Groundhog Picnic and it magically gives him seven more years of life. To her credit, my one student expressed just as much skepticism about these reporters’ reactions to Phil as to the Inner Circle’s lavishing praise upon him. In any case, I certainly learned a lot about the history of my own state today, such as the fact that Groundhog Day has been celbrated since 1887! And that it has its origins in Candlemas traditions brought by the first Pennsylvanians (If we can believe anything that site says, that is). We tried to watch the live stream (seriously, they have a freaking live stream of the events!) at around 3 pm, which would have been 6 am EST, when the festivities supposedly began, but it didn’t work, whether because my Internet was too slow, or there were too many people tuning in. I know a lot of people were probably glued to their computer screens, eager to find out the prediction! Later, I learned that he did indeed see his shadow, so there will be six more weeks of winter. Do you think that applies only to America? Or can I take this as a worldwide prediction? Honestly, I think only six more weeks of winter would be getting off easy up here in the Arctic. I was slightly ashamed to admit, when a colleague asked, that I have never been to the Groundhog Day festivities myself, even thought Punxsutawney is only, like, two hours away from Greensburg. Someday! It’s on my bucket list! And now that I’ve dealt with -22° (that’s Fahrenheit, not Celsius, kids! ), whatever weather Pennsylvania throws at me in early February should be a breeze. Coming soon: Eurovision and Dima Bilan! Let me know when you go, and I’ll tag along. I am originally from DuBois (about 25 miles from Punxsutawney) and I have never been there either. I’m sure you would not remember this, but I made a trek to Punxy for the Groundhog Day event at Gobbler’s nob. That was in 2002, so the date was: 02/02/02. Quite a year. Punxy on Groundhog day and Cucso for my birthday. The event is nothing like the one portrayed in the movie. It’s more like a mash-up of a county fair and a frat party, with the action shifting occasionally so that someone can surprise his girlfriend by proposing right there in front of God and Phil.